WELLNESS HOTEL BABYLON is part of a unique fun island – CENTRUM BABYLON. It is located in the heart of the district town of Liberec in Northern Bohemia, in the Liberec basin between the Ještěd Ridge and Jizera Mountains. Part of the Liberec Region are also the Krkonoše and Lusatian Mountains protected landscape areas, which conceal beautiful forests and valleys and create a very pleasant environment for visitors with their many interesting tourist destinations. The location of the picturesque district town of Liberec offers a unique combination of outdoor activities in the surrounding countryside and cultural events in the historical town centre. 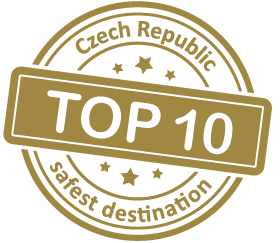 It is also advantageously located only 100 kilometres from the capital city of Prague. The city boasts many significant buildings, e.g., the town hall, built in the Neo-Renaissance style and completed in 1893, which is a symbol of the prosperity and economic and cultural growth of the town. Behind the town hall there is the F. X. Šalda Theatre, dating back to 1883. The buildings of the spa, museum and chamber of commerce, with their magnificent and clean style, create the golden core of the town’s historical part, whose centrepiece is a unique villa quarter dating back to the turn of the 19th and 20th centuries which with its uniqueness portrays the boom Liberec enjoyed at that time. Liberec is sometimes called “The Town below Ještěd”. This peak, reaching 1012 metres, is adorned with a modern tower including a hotel and a restaurant, which has become a dominant feature of the whole region. The original construction, in the shape of a rotational hyperboloid, was built according to plans by the architect Karel Hubáček, who later received the prestigious Perret Prize for the design. Another magnet for visitors is the Liberec ZOO, dating back to 1919 - the oldest of its kind in the Czech Republic. Currently, the Zoo focuses on breeding rare, and in the wild often critically endangered species, of which Liberec’s rarity - white tigers gets the most attention from visitors. Another significant point of interest of the town is the Botanická zahrada Liberec botanical garden. The DinoPark (in the OC Plaza shopping centre), which is designed primarily for families with children, exhibits up to 70 models of prehistoric animals in 30 settings with accompanying sound effects, a 4D cinema, a path for brave children – “DinoTrek” - and much more. Film enthusiasts can visit one of the two multiplex cinemas in Liberec - CineStar (in the OC Nisa shopping centre) and Cinema City (in the OC Fórum Liberec shopping centre). An important part of the cultural life of Liberec is the Severočeské muzeum museum. Its permanent exhibitions include an exposition of applied arts from antiquity to the present, an exposition of natural sciences, archaeology, history, mechanical musical machines, photography and artistic posters. The Oblastní galerie gallery in Liberec boasts a permanent exhibition of Dutch painting of the 16th - 18th centuries, 19th century French landscape painting, German and Austrian painting of the 19th century, and Czech art of the 20th century. You can also visit the Galerie Studna, Galerie Liberec, Galerie prostor 228 and Galerie Aktualität des Schönen galleries. Krajská vědecká knihovna - the Regional Research Library, is another important cultural centre of the town, as well as the entire region. It is truly an extensive source of information thanks to its collections including over a million individual pieces of literature, a large collection of norms, sheet music, maps and access to online databases. Among other important cultural institutions of the town are the Kulturní a společenské centrum Lidové sady cultural and social centre and the Dům kultury Liberec cultural centre. The surrounding area of Liberec and the town itself offer a number of possibilities to practice various sports at both an amateur and professional level. You can take advantage of the surrounding mountains, which provide ideal conditions for recreational hiking, cycle tourism and cross-country skiing, and even golf. The ski resort built on the slopes of Mt. Ještěd is dedicated to downhill skiing, cross-country skiing and ski jumping. There is also the Cross-country Ski Area in Vesec serving cross-country skiing. For sport directly in the town it is possible to use the multifunctional Home Credit Arena, which is the home of ice-hockey club Bílí tygři Liberec), the Stadion U Nisy football stadium, the home stadium of FC Slovan Liberec, and a swimming pool. Both professional golfers and beginners will also be satisfied. In close proximity to Liberec you can choose from several golf courses to play at. These include Golf Grabštejn, Golf Harrachov, Golf Liberec, Golf Malevil, Golf Semily, YPSILON GOLF RESORT LIBEREC and also Golf Ještěd, a picturesque course located on the sunny side of Ještěd’s foothills, which offers a variety of activities for golfers, beginners and families with children, including a newly opened 6-hole Golf Academy.